In a mountainous region in the heart of Ethiopia, some 645 km from Addis Ababa, eleven medieval monolithic churches were carved out of rock. Their building is attributed to King Lalibela who set out to construct in the 12th century a ‘New Jerusalem’ after Muslim conquests halted Christian pilgrimages to the Holy Land. Lalibela flourished after the decline of the Aksum Empire. There are two main groups of churches – to the north of the river Jordan: Biete Medhani Alem (House of the Saviour of the World), Biete Mariam (House of Mary), Biete Maskal (House of the Cross), Biete Denagel (House of Virgins), Biete Golgotha Mikael (House of Golgotha Mikael); and to the south of the river, Biete Amanuel (House of Emmanuel), Biete Qeddus Mercoreus (House of St. Mercoreos), Biete Abba Libanos (House of Abbot Libanos), Biete Gabriel Raphael (House of Gabriel Raphael), and Biete Lehem (House of Holy Bread). The eleventh church, Biete Ghiorgis (House of St. George), is isolated from the others but connected by a system of trenches. Near the churches, the village of Lalibela has two story roundhouses, constructed of local red stone, and known as the Lasta Tukuls. These exceptional churches have been the focus of pilgrimage for Coptic Christians since the 12th century. The rock-hewn churches of Lalibela are one of the most significant world heritage sites on Earth, but probably the most famous attraction in Ethiopia. With this visit I have now been to 11 of the first 12 World Heritage Sites. Despite the fact that 11 churches are listed, there are really just three clusters of churches. Many of the churches are just caves dug into the side of one of the main pits, so the door of one church is just a few meters from the door of the next church. The most popular church and the one shown in the photo is St. George’s which was the last of the churches built. All of the lessons and techniques learned on the other churches were put in place on St. George’s Church. It is easy to walk between all the churches and you can easily visit all 11 in a single day. All of the churches are very small and can only accommodate a small number of people at one time. The trick is getting to Lalibela which is a small community in the mountains. There is an airport which services the town and has flights daily from Addis Ababa. I’d recommend hiring a local guide for the day, else you will not have any context to what you are seeing. The Rock-Hewn Churches in Lalibela is a cultural UNESCO World Heritage Site in Ethiopia. It is located within the Amhara region in Ethiopia, specifically in the city of Lalibela. This site is known for the monolithic rock-cut churches. 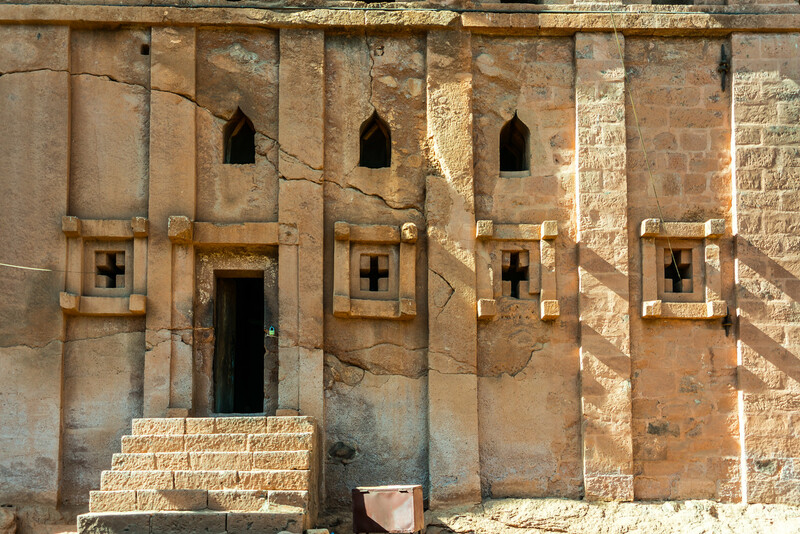 These churches are definitely one of the top attractions in Lalibela, however, it cannot be denied that this town is filled with many ruins and remnants of medieval and post-medieval civilizations. 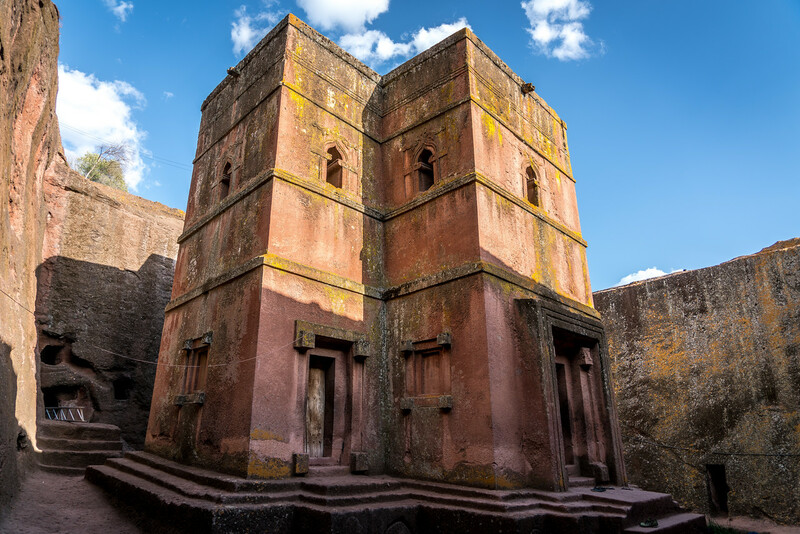 The Rock-Hewn Churches in Lalibela also speaks to how Ethiopia is one of the first nations to adopt Christianity during the first half of the 4th century. This city itself is considered as one of the country’s holiest cities, second only to Aksum, which is another UNESCO site in Ethiopia. The Rock-Hewn Churches are the pinnacle of the identity of Lalibela as a highly Christian town in Ethiopia. Aside from these churches, it is also a center of pilgrimage. The main difference it has over Aksum, another holy city in Ethiopia, is the fact that the population of Lalibela is majority Ethiopian Orthodox Christian. 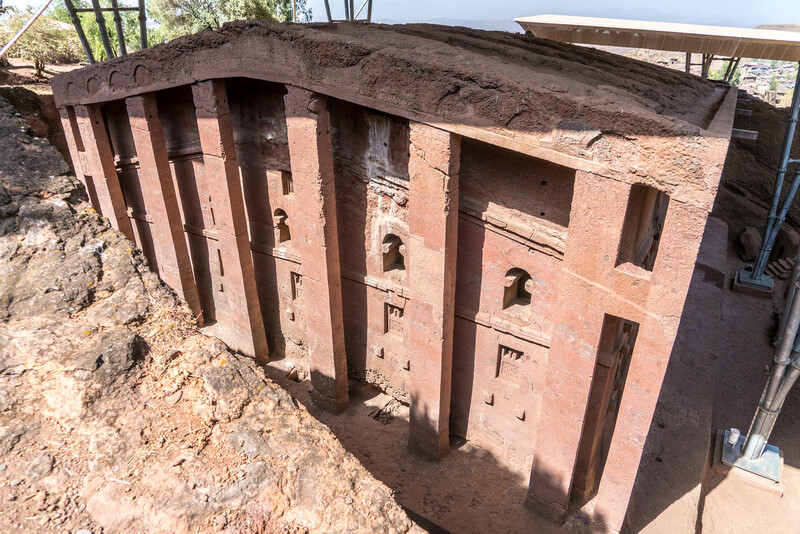 The Rock-Hewn Churches in Lalibela can be traced back to the 7th to 13th centuries. Hence, these churches were built around the time of Zagwe dynasty King Gebre Mesqel Lalibela’s rule in Ethiopia. The places and major buildings in Lalibela has been widely accepted as a symbolic representation of Jerusalem. Hence, this also speaks to the Christian ties in the city. 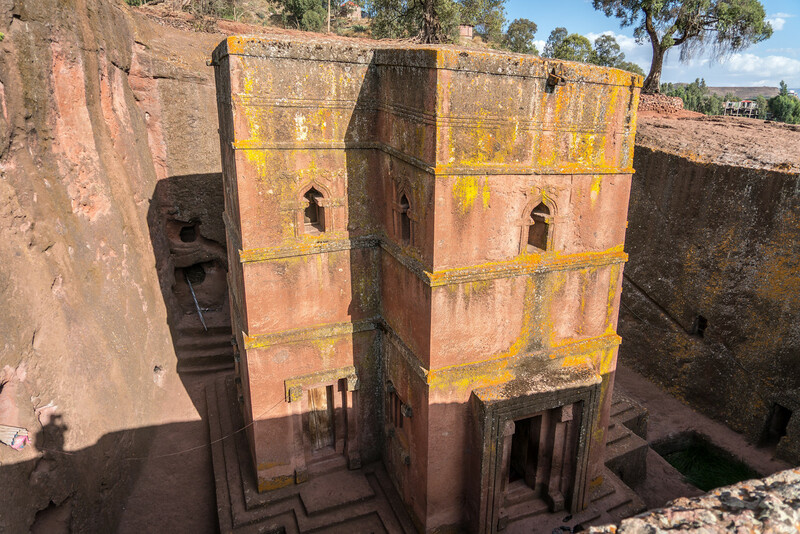 There are several legends and stories that surround the construction of the Rock-Hewn Churches in Lalibela. The most popular one was that an angel came to Lalibela and instructed for these churches to be built. The same legends also claim that it took 24 years to build these churches. However, archaeologists refute this claim saying that this was an impossible feat. Even with today’s technology, accomplishing these kinds of structure within that span of time would not be possible. The Rock-Hewn Churches were built out of solid rock from top to bottom. They were excavated externally and internally. Moreover, they use different styles to carve out the details of these churches. There are also several peculiarities about these churches that did not seem to add up. For instance, there should be a massive amount of stone and earth that were removed upon the construction of these churches. 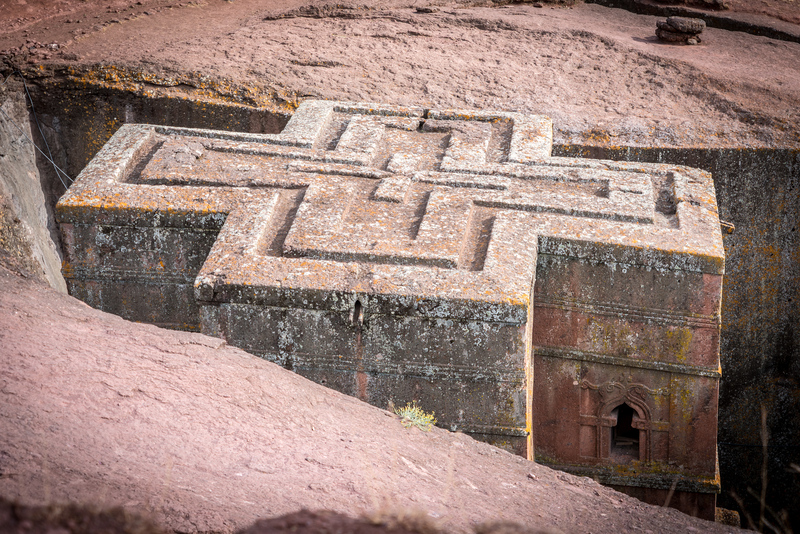 Indeed, the Rock-Hewn Churches in Lalibela is an extraordinary UNESCO site. It is an attraction you won’t find elsewhere in the world. View my complete list of UNESCO World Heritage Sites in Ethiopia. Beautiful place, fascinating. Thanks for sharing your experience with us!